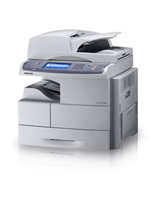 The SAMSUNG SCX-6555N delivers high performance with a 250,000 pages-per month duty cycle, 3,240-sheet paper capacity, and an open architecture that enables advanced document workflow solutions. The SCX-6555N comes loaded with productivity enhancing features like an intuitive 7-inch color touch-screen control panel, 80 GB hard drive, advanced color scanning capabilities and more. With the SCX-6555N laser MFP, it’s not hard to imagine. Enhance your security by incorporating a badge reader or bio Recognition. Use a card swipe to keep track of your throughput. Scan and auto send documents to your team members without a computer as well as access your network to print documents and forms without a computer.